Needlework is a genre filled with amazing (and amazingly cute) accessories, so narrowing them down to just five of my favorites was pretty tough. But, after staring at several balls of cotton floss for an hour, I finally decided to leave the thread, floss, and fabric to another day, and just focused on my best-loved embroidery tools and notions. I craft for a living, so keeping my floss collection wound on bobbins and stored in floss boxes saves me a ton of time and money—it never gets tangled, and I can always see exactly what I have on hand before starting a project. A bobbin winder cuts the time it takes to wind a skein of embroidery floss around a plastic bobbin in half. That time savings means that I always wind my floss as soon as I get it instead of tossing it in a drawer to get lost or tangled. Well worth the whopping $2.00 I spent? Definitely. 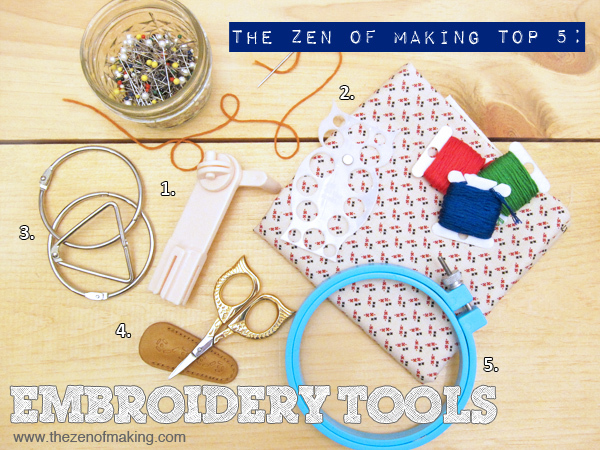 Whenever I’m working on an embroidery project, this little owl embroidery floss organizer is right there with me. It saves time by keeping my colors organized and at the ready, and I can load it up with pre-cut pieces so I don’t have to stop stitching and dig for floss when I’m on a roll. I have several other floss organizers, but this one’s my favorite. It’s the perfect size to zip into my supply pouch, and I love that there’s a magnet at the top so I can set down my needle without worrying about losing track of it. Metal floss rings (binder clips) are my go-to organization method for stitching on the go. Plastic floss bobbins have a built in hole at the top of each, so you can loop your colors onto a ring and toss them into your project bag. Not only are they adorable, these owl-shaped embroidery scissors are also the most sturdy, reliable pair of embroidery scissors that I’ve ever owned. The blade stays sharp, the cuts are precise, and I always feel like I have good hand control when I’m using them. I’ve used many different kinds of embroidery hoops, but these plastic hoops from Susan Bates are my favorite. They seem to stretch fabric more evenly than wooden hoops, and the tightening wheel is much easier to grip. Since the plastic doesn’t have much give, it’s easy to make sure that your fabric stays taut so your finished project doesn’t end up distorted. You might want to check out the OttLite from my TZoM Top 5: Must-Have Crochet Tools roundup—it’s perfect for making detailed stitches and keeping an eye on fabric weave! Okay, stitchers. What’s on your list? Good scissors, floss-a-way bags, metal rings, a metal board, folding stand and some magnets. I dont bother with bobbins anymore, I hate the crease it puts in my floss and I have never used any of the cute floss organizers because the cats just see those as new flossy toys. I stitch in hand all the time now too, so I have tossed all my qsnaps, hoops, etc. Oh yeah….good project bags! I cant live without my project bags!